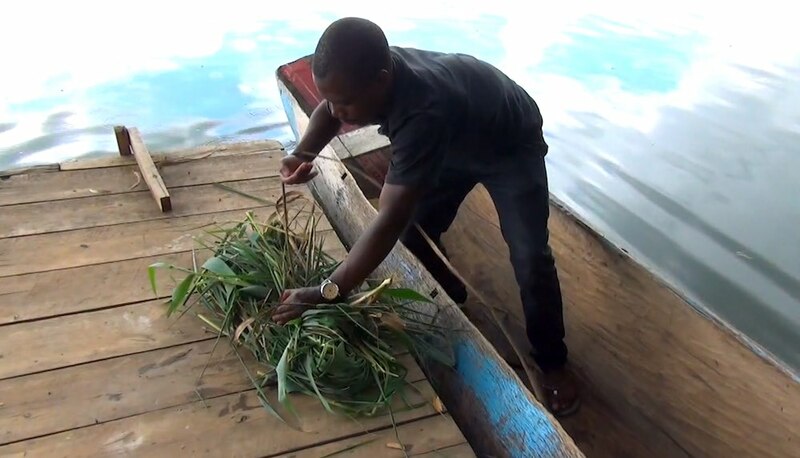 I’m very proud to be born on the shores of Lake Bunyonyi, a safe lake in southwestern Uganda without any dangerous animals and safe to drink (if you are not a Mzungu = white person). We people around this lake are the strong tribe known as Bakiga. We can paddle 15-20km in 10 hours, as long as you feed us well! Our women are powerful and they carry their babies on chest, breastfeeding while canoeing to their gardens. Most crop farming happens on plots easily accessible by boats and that is why women show some talent with the canoe. I like canoeing because it is my skill. I knew how to canoe when I was 9 years old. I gained the talent from my older sister. 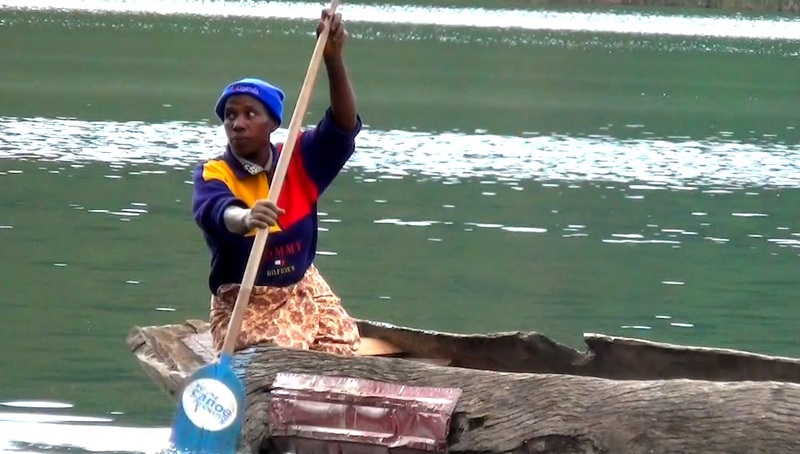 I went to the lake to fetch water with her and when we found a canoe with paddles, we tried it out. By dusk that day I had mastered the skill of canoeing. Years later I took the forth position at a Lake Bunyonyi canoeing competition organised by the Governor of Bank of Uganda. We were 8 competitors and they promised us phones and shoes but at the end they gave us USh 5,000 (US$ 1.5) in an envelope! 10 years ago around the lake, there were 1,000 canoes which meant that every individual owned one and paddling was an interesting part of their lives. Then people got so lazy to because they could easily get onto a motorboat. These boats are as cheap as minibus taxis on the road. Lumbering is a problem as well, people need money and they sell trees before they are big enough for canoe making. Canoes made out of eucalyptus will last less than 10 years, while indigenous trees’ wood could last for decades. 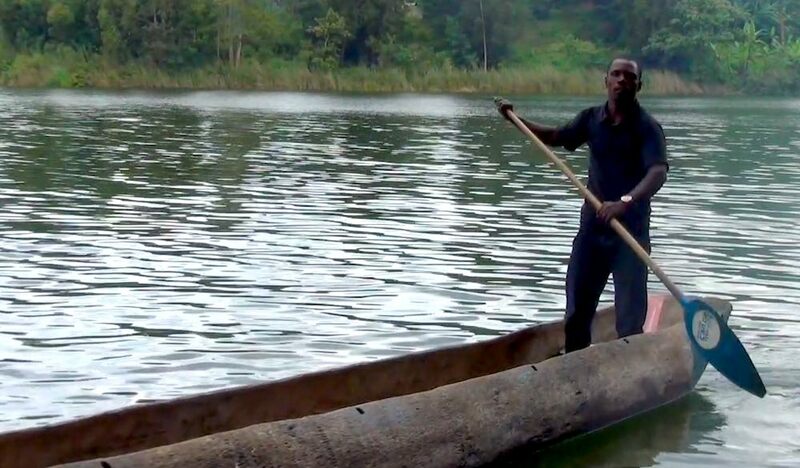 The future of canoes on Lake Bunyonyi is therefore not promising and soon we will surely miss canoeing. If tourists come to the lake, they usually try to canoe around it but they just cannot do it. 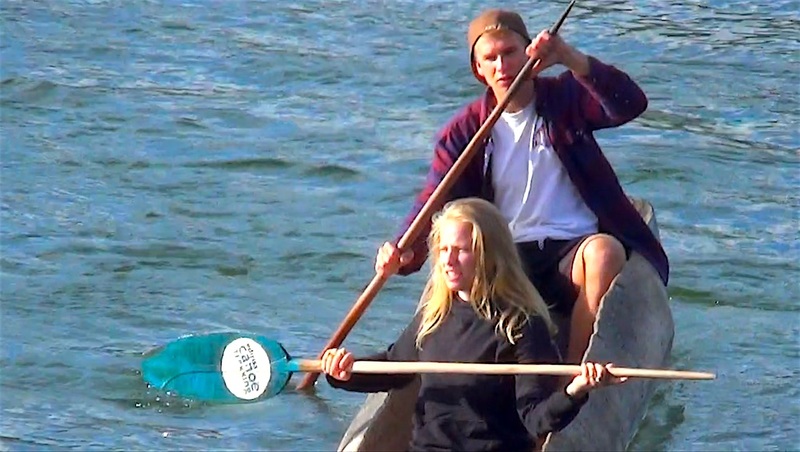 They know kayaking and sailing but when they reach the Gorilla Highlands, canoes, paddles and stools are different. First of all, if you are not the captain you have to position your stool in the middle of the canoe in order to balance it. Locals also make comfortable grass seats. Knowing paddle sides is important, the flat and the curved side. 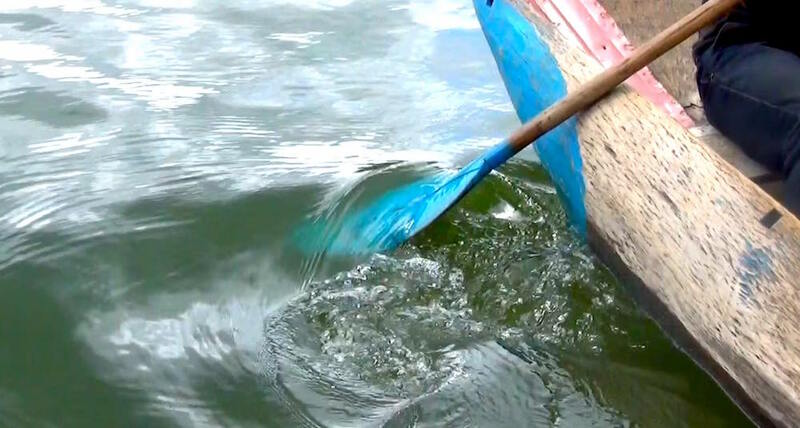 On Bunyonyi we push the water with the curved side while at Lake Mutanda they say that is for women only. They use the flat side which calls for more power. Bazungu always want to use the flat side too, like how they know from kayaking. To make sure that your canoe keeps the direction you want, you don’t need to paddle on both sides. Instead you push the water with your paddle towards the canoe, or away from it, to gently influence where it is going. Remember that it is only the captain who can direct the canoe. Even if 10 people paddle against his wishes, he still prevails because of his position at the end of the canoe. He sits taller than everyone else and knows where he is going. If he doesn’t sit in the middle of the captain’s seat but more to the side, the canoe will not be balanced and everybody will feel uncomfortable. All in all, even if you are completely new to canoeing but you have a good captain, you will be fine. No matter how experienced you are, canoeing while standing is fun as you get some rest from sitting. If you are a canoeing fresher, only stand in a big canoe in order to avoid scaring the team. Some clans like the Bakongwe and Bayundo like to steal canoes so you better take paddles with you after landing. Otherwise they will use your own paddles to steal your canoe. Just recently it took me days to find a stolen canoe that Edirisa customers took to the market called Rutinda and left it there by night. You eventually find any stolen canoe that isn’t new but the process is inconvenient and you must give gifts to the ones who track it. 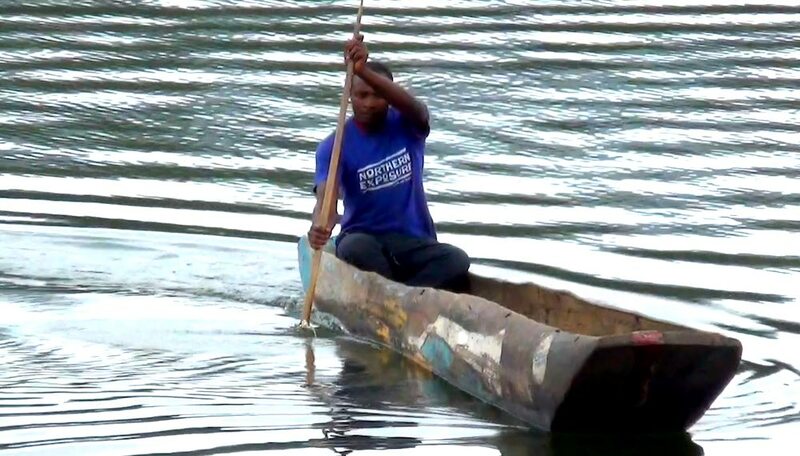 If your canoe is new, on the other hand, somebody can repaint it, rebrand it, use some iron sheets to make it look different and then you lose it forever. It is good manners here to lend and borrow your canoe. If you don’t share, you will be left without anything if somebody steals your canoe – you will not even be able to look for it because nobody will lend you their canoe!